The books forming the Mediaș Jewish Library were discovered in the Mediaș synagogue in 2008. Through a generous grant, many of them have been catalogued and are now stored in the house adjacent to the synagogue (Casa de lângă Sinagogă) in Mediaș, alongside the community archives. The library appears to contain both private and communal books, that is prayer books from individual community members as well as books that presumably comprised the community library or study room, many of these may have been the property of the rabbi. In addition to religious books, there are also secular books, including both fiction and non-fiction. For more information on the scope of the library contents itself, please see the general entry for the Mediaș Jewish Library. 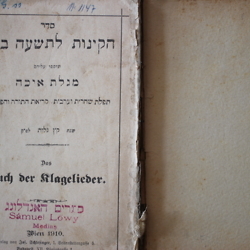 If you would like more information regarding this book or another from the Mediaș Jewish library, please use the contact information under "rights holder". Please note that only pages of potential interest for descendants or researchers were digitized. The books in their entirety can be viewed on location in Mediaș. The digitized content represents only single pages with personal signatures or dates. Wien: Verlag von Jos. Schlesinger; I. Seitenstettengasse 5. Stamp: Sámuel Lőwy, (in Yiddish) "prayer book shop"